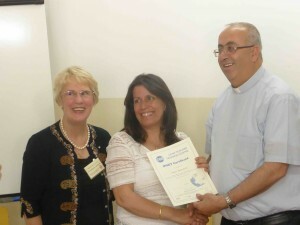 Annual CNT Teacher Training programmes have continued since 2016 as CNT Trustees decided to concentrate on these training programmes as the best means of assisting the children in the schools of the Latin Patriarchate. Our Team of three faithful tutors, Richenda Askew, from Lewis School of English, Southampton, with Jackie Halsall and Jonny Kowal, have now been joined by David Pearce, a Drama specialist. As technology has developed, we have been able to follow the progress of the 2017 Jordanian LPJ Group and a further new 2018 Jordanian LPJ group using WhatsApp. The teachers post messages showing their new skills on WhatsApp forums, giving continuity, momentum and opportunities to share best practice. These encourage teachers to have the confidence to experiment with new ideas. The WhatsApp forums are extensive, showing children enjoying working together, creativity and the imaginative use of resources, the skills required in the 21st century. Our tutors give these posts an encouraging response, post relevant ideas and set suitable tasks to extend skills and expertise. Most heartwarming have been the recent videos of senior pupils leading a carol concert in fluent English and debating why Christmas must not be treated as a materialist celebration. Training by CNT has reaped dividends. The teachers say that the training they have received has exceeded expectations. We are asked to return again and again, for there is always more to do and more remoter schools to help. “In the midst of our pride and jubilant atmosphere celebrating the outstanding Tawjihi results, I want to thank you, for your time, unconditional support and generosity. You are our backbone. You were always there when we needed support. We have started a well -planned professional development programme for our teachers for six years now. This had and will have an effect on our student’s academic performance. A student from LPS Fuheis came second in the Tawjihi Exam Scientific stream among students from all schools in the Hashemite Kingdom of Jordan. And another six students from LPS Huson and Wassieh too first, fourth, sixth and tenth places in the directorate’s highest ranking. I would like to express my sincerest gratitude again and again. 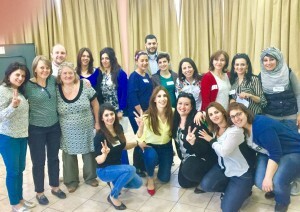 In 2018 the Team spent a week in Amman delivering training at various levels to 43 LPJ teachers. 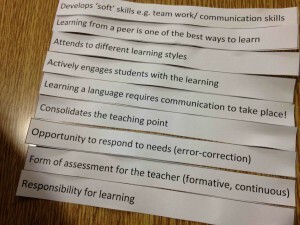 The introduction of a Drama element – encouraging teachers to inspire learning English through Drama – proved very popular. See the the 2019 newsletter. In 2019 Plans are underway for two further training projects. There will be a week in Palestine in April for 43 teachers in three groups. After an interval, we were asked to return to Palestine as ‘ours was the best training‘. We are looking forward to seeing old and new friends. In October we will return to Jordan to see how the latest group of teachers are progressing. We will be travelling across the country carrying out observational visits to both the 2018 Group of teachers and those who had received earlier training. Whenever possible we will be offering training to other teachers in these schools. Tutors and Teachers begin Second Phase Training April 2017. Our three Lewis tutors flew to Amman at the end of April to continue the training begun last October (2016). They delivered two workshops and then carried out two separate observational visits with all the teachers in their schools. The tutors were very impressed and heartened by how much had been retained from the previous training and by the enthusiastic responses of the teachers. A new cohort of trainers is emerging. Unfortunately, the last day of the training was cancelled as the Jordanian Government moved the May Bank holiday at very short notice. A WhatsApp forum, a learning community, has been created which will ensure that the teachers continue to develop best practice. These visits provided a logistical challenge, travelling the length and breadth of Jordan. Our thanks to the LPJ education department for organising the transport arrangements. As well as providing for school fees, CNT has embarked on a parallel initiative in training teachers who are the educators of the next generation. Responding to a request from Fr Imad Twal, the then LPJ Director of Education in Jordan, for help with training teachers of English, an ambitious programme started in 2011. LPJ teachers are academically well qualified but receive no teacher training before starting their careers. Training for LPJ teachers is not provided by the state and the LPJ has insufficient funds to provide its own training. Fluency in English cannot be underestimated. It is the global language, the language of higher education in the Holy Land and is the passport to work in a land where unemployment is very high. CNT contributed £5,000 to the early stages of this project. From 2011 many LPJ teachers of English received training on line. They then participated in workshops and seminars delivered in Ramallah and Amman by specialist language teachers from Lewis School of English in Southampton www.lewis-school.co.uk. These highly committed teachers enthusiastically embraced change and rapidly acquired confidence in their new -found skills. When the tutors, initially called ‘The Flying Squad’, returned to observe them in their classrooms, they could see that transformation was underway. Some Jordanian teachers also attended higher level training in England and now lead training, cascading best practice in their own and other LPJ schools. Reports from visits to their schools have noted an impressive command of English. More significantly, these teaching methods being applicable in other subject areas, have helped with the general transformation of teaching and learning within the LPJ schools. As part of its educational outreach, CNT provided £7,000 for a Train the Trainer Project. When it proved unlikely that the Palestinian teachers would to obtain UK visas to train at a higher level in England it was decided to take the trainers to them. The trainers went to Ramallah in May 2016 and delivered a week of high level training to fourteen teachers(one from each LPJ school in Palestine and Israel, including the seminary). This challenging training proved highly successful, creating a strong cohort of trainers for the Palestinian and Israeli schools. Dr Said Saidam, the Minister of Education for the Palestinian Authority, was impressed with these innovative initiatives. Fr Faysal Hijazeen, the Director of Education in Palestine and Israel, and his Principals were ready to use this expertise in INSET training. Sadly, Fr Faysal died suddenly in July 2016. His teachers, who he called ‘candles shining the way forward for their pupils’, are cascading best practice. His successor, Fr Iyad Twal, welcomes any help we can provide.